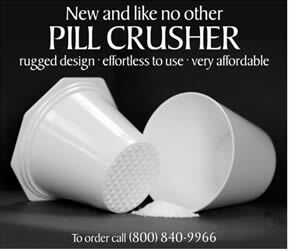 ST. LOUIS, 06/21/02 - From Pills to Powder in no time - Care Giver Supply, Inc. (CGS, Inc.) d/b/a PILLCRUSH.COM has introduced The Crush Cup/Pill Splitter and The Mega Crush Cup. The Crush Cup/Pill Splitter services the needs of the small animal market by providing the most convenient way of splitting and crushing medication tablets. The Mega Crush Cup was specifically designed for the large animal and equine markets. Crushing large format medication (multiple 1 gram tablets) is now convenient, quick and easy. Simply place the tablets between the cups and grind by grasping the Cups and rotating the top and bottom cups in opposite directions. After medication is crushed to a fine powder it can be administered in a variety of formats, i.e. liquid, paste, etc. The Cups are designed for use in pairs with a grinding area located between the cup surfaces. The grated design allows for uniform grinding of tablets eliminating lumps of unground medication. Cups are constructed of thick, heavy-duty, plastic designed to withstand repeated use. Lg. Mega Crush Cup -- Outside Dimensions: 3-1/2"W (90mm) across top and 2-1/4"W (56mm) across the bottom x 3"H (76mm).